The DC PACT (Positive Accountable Community Transformation) is a Collective Impact coalition effort of community providers, including social service non-profits, faith institutions, behavioral health providers, hospitals, and community health centers, in partnership with multiple District government agencies including the Department of Health Care Finance, Department of Health, Department of Human Services, Department of Behavioral Health, and Department of Disability Services. DC Primary Care Association serves as the Collective Impact “backbone” organization, guided by an Advisory Council. 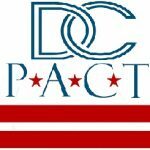 DC PACT is working to test the theory that the District has much of what we need to thrive, if we align our resources around our community’s needs and strengths.. Raw data + was updated by David Poms. Strategy card settings were updated by David Poms.